The story of a priest martyred by the government for not being a team player. The Twenty-Second Sunday after Pentecost. The Sixth Sunday after the Holy Cross. The Holy Martyrs Terence & Neonila. Our Holy Father & Hymnographer Stephen the Sabbaite. 1:45 PM 11/7/2012 — In my homilies to you over the years, I’ve often spoke of our Catholic Faith, and sometimes of our Byzantine Tradition; but I have rarely spoken of the particular Church to which we belong, and of it’s history in Eastern Europe. Our Metropolitan Church is located entirely in the United States; and, the further you travel outside of Pennsylvania, the less you see of any ethnic identity among the members of our parishes; but, as you know, the ancestors of our Church’s original members came from an Orthodox Church which came into union with Rome in 1646 at the Union of Uzhorod, which today is the seat of it’s own Metropolitan Church. I mention this because this week we celebrate the feast day of one of the first men ever beatified from this shared tradition of Ruthenian Catholicism; and I thought it would not be inappropriate to share with you his story. 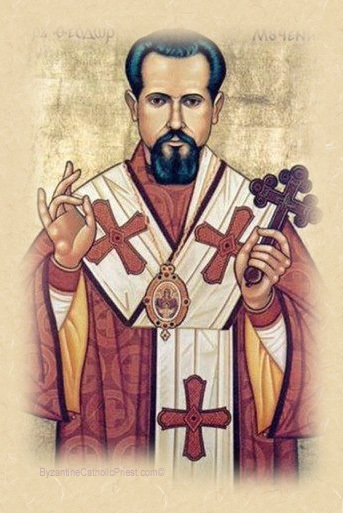 In the Liturgy of John Chrysostom, just before the Creed is sung, the priest blesses himself three times and silently says, “I will love you, O Lord, my strength; the Lord is my rock and my refuge.” These words, taken from Psalm 18, were the ones chosen by Bishop Theodore G. Romzha as the motto for his episcopal ministry. At the age of 33, he faced the one of the most brutal and bloody persecutions of a Christian community in modern times. Theodore Romzha was born of humble parentage on April 14, 1911, in the heart of the colorful district of Maramorosh in Subcarpathian Ruthenia, a small territory between Slovakia and Ukraine. He was a pious and gifted young boy, and his only ambition was to become a priest. He received his secondary education in the city of Chust; and, due to his friendly disposition and scholastic achievements, he became one of the most popular students. His popularity increased even more when he proved himself as an all-around athlete, excelling in soccer. At his graduation, he took everybody by surprise when he announced his intention of becoming a priest; and he was sent to Rome for his priestly formation. He lived at the German-Hungarian College in Rome for the first two years of his studies; then, in 1932, he moved to the Russian Pontifical Seminary, known as the "Russicum," in order to prepare himself for missionary work in the Soviet Union. It was indeed a providential step; since at the "Russicum" he was expected to study communist atheism and its ideology; unwittingly preparing himself for the Soviet occupation of his native land. He was ordained to the priesthood in Rome on Christmas Day, 1936. 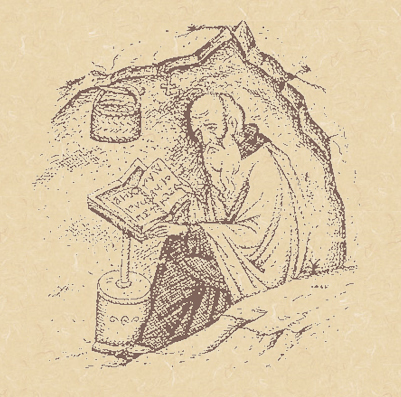 In the summer of the following year he came home to celebrate his first Divine Liturgy in his own country with the intention of returning to finish his doctoral dissertation. But, in those days, the priesthood was not an exemption from military conscription; and, instead of returning to Rome, he was drafted into the army and sent to protect his country against the German invasion. To a friend in Rome he wrote: "I am going to the front with a deep conviction of doing the will of God. Therefore, I do not fear what will happen to me." 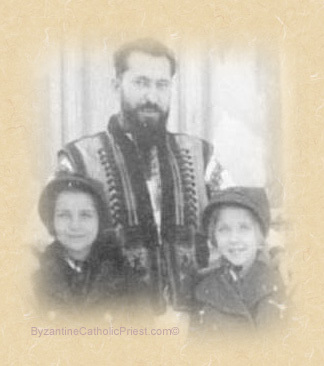 After Father Romzha's discharge from the army in August, 1938, the danger of another approaching war remained. For this reason the bishop of Mukachevo, Alexander Stojka, did not permit him to leave the country, but appointed him to a forgotten parish in the countryside, where the young Father Romzha became a poor pastor among poor people. There were times when he could afford only one meal a day while donating from his own purse to help his needy parishioners. To a curious friend in Rome he wrote: "I live here as a pauper and yet I feel happy and satisfied." Father Romzha was a good and dedicated priest, teaching his parishioners to know and live their Faith by his own example. Even at the seminary, Father Romzha found time for pastoral work by assisting in neighboring parishes, and conducting missions and retreats for young students. Every penny he earned he generously distributed to the poor. 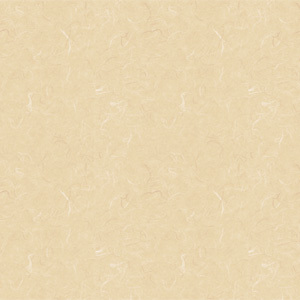 To the mentioned friend in Rome he wrote: "I am living very unpretentiously, and yet my pockets are always empty. But I am not discouraged, since I am working not for the money but to please God." 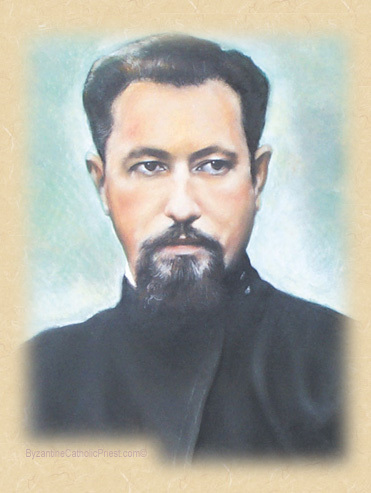 Bishop Stojka greatly appreciated the dedicated work of Father Romzha, and in 1942 elevated him to the rank of Archpriest. Even so, he remained a humble and dedicated priest, inspiring and winning the admiration and respect of all those who met him. On May 31, 1943, Bishop Stojka died. In view of the uncertainties of the time, the Holy See appointed Archpriest Romzha the Apostolic Administrator of Mukachevo; and his episcopal consecration took place in Uzhorod on September 24, 1944, just as Soviet tanks were rolling into the city. A month later, the entire territory of the Mukachevo Eparchy was occupied by the Red Army. Bishop Romzha was informed that Subcarpathian Ruthenia would be incorporated into postwar Czechoslovakia as an autonomous province; however, it soon became evident that the Soviets would not relinquish this politically strategic region. Consequently, on June 29, 1945, Subcarpathian Ruthenia was officially incorporated into Soviet Ukraine; and the young and inexperienced Bishop Romzha found himself and his flock under Soviet rule. At first, Bishop Romzha tried not to antagonize the Soviet authorities, in spite of abusive and violent actions committed by the Soviet soldiers against the clergy; but when the Soviet authorities started to expel priests from their parishes at random and confiscate church property, he was forced to protest. The Soviets had a ready answer: to ensure the continuance of his ministry and the safety of his clergy, Bishop Romzha must renounce all allegiance to the Pope, place himself under the jurisdiction of the Patriarch of Moscow, and encourage his flock to do the same. Bishop Romzha immediately replied: "I would rather die than betray my Church!" Thus began the open persecution of the Byzantine Catholic Church in Subcarpathia. In the fall of 1945, Patriarch Alexis of Moscow appointed Bishop Nestor Sydoruk to head the Orthodox Eparchy of Mukachevo. Sydoruk was announced by the Soviet press to be the only legally appointed bishop in Ruthenia, and received full support from the Soviet authorities. Intimidation and imprisonment of Byzantine Catholic priests followed; and the official liquidation the Byzantine Catholic Eparchy of Mukachevo was underway. Rather than flee, Bishop Romzha decided to fight. Although the Soviet authorities confiscated his car, he traveled long distances by horse and buggy, just to reassure his faithful and to encourage them to persevere until death, saying, "They are taking from us our own priests and churches, but they will never be able to take away our faith from us." During these extensive and dangerous visitations, Bishop Romzha tried to sustain the faith of the weak, to reassure the wavering, and to plead with those intimidated: "Faith is our greatest treasure on this earth,” he said. “To preserve our faith we must even be ready to lay down our life. If we must die, then let us die as true martyrs, defending our faith. One thing is sure: that we never will abandon our faith nor betray our Church." The faithful, supported by dedicated clergy, responded enthusiastically, and stood united behind their fearless shepherd. Even some Orthodox parishes, seeing the violence and injustice perpetrated by the Soviets, asked Bishop Romzha to accept them back into the Catholic fold. During these days of violence and open persecution Bishop Romzha offered his prayers and sufferings for the perseverance of his clergy and the faithful he risked so much to serve. He was sustained by his unshakable confidence in God's Providence; and down deep in his courageous heart he vividly felt the protection of the Theotokos, the Mother of God. There was no power that could shake his loyalty to the Holy See; in his mind there was only "one, holy, Catholic and apostolic Church," established by our Lord on the rock of Peter, and governed by His Vicar on earth. For this truth Bishop Romzha was ready to sacrifice his own life. Unable to intimidate Bishop Romzha, the Soviets decided to assassinate him, and staged a highway accident. The horse drawn carriage in which the Bishop was returning home from the rededication of the parish church of Lavki, near Mukachevo, was rammed by a military truck. Soldiers dressed in civilian clothing then emerged and beat him; but, when another truck came by, they fled. Bishop Romzha was badly injured, but survived; and the driver of the second truck took him to the hospital in Mukachevo where, after a few days, he began to regain his strength. Then suddenly, early on the morning of November 1, 1947, he was found dead. The night before Bishop Romzha's death, the director of the hospital and a strange nurse, who had disappeared the next day, were seen entering the Bishop's room about midnight. The Soviet authorities announced that Bishop Romzha died from "injuries sustained in a traffic accident"; but a later investigation showed that he had, in fact, been poisoned. Bishop Romzha was beatified by Pope John Paul II on June 27, 2001. His relics are enshrined in the Cathedral of the Exaltation of the Holy Cross in Uzhorod.